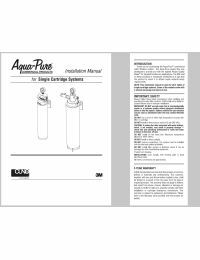 The 3M AquaPure 62130-24 is also known as the VH3-JG Filter head. This head is ideal for hi-flow series cartridges by 3Μ™. This head features 3/8'' John Guest Quick Connect fittings for the inlet and outlet. The 62130-24 has an integrated water line switch, a pressure relief valve, and a wall-mount bracket. Note: This is the ideal replacement head assembly for the 3MFF100 & FF-6000 Full Flow Drinking Water Systems.